This illustration is one of the latest editorial pieces completed for the American Academy of Family Physicians featuring The Evaluation of Syncope. Syncope is a brief and transient loss of consciousness with complete return to pre-existing neurologic function. It is classified as neurally-mediated, orthostatic, cardiac and neurogenic. The elderly are likely to have orthostatic, carotid sinus hypersensitivity or cardiac syncope, whereas, younger patients are more likely to have neurally-mediated syncope. 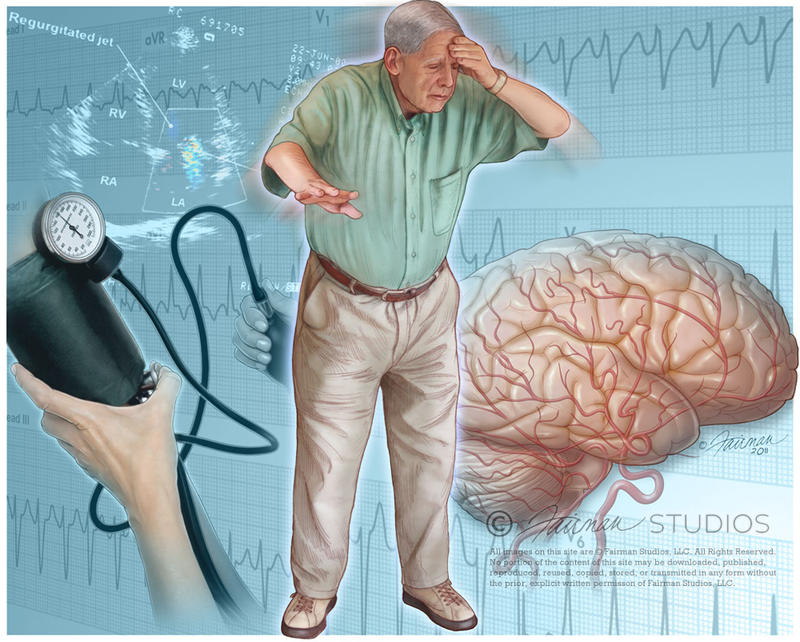 Common non-syncope syndromes with similar presentations include seizures, metabolic syndromes, acute intoxication,psychiatric disorders and cerebrovascular events. The majority of patients presenting with unexplained syncope will require admission. Several risk stratification tools have been investigated to assess the risk of short-term death and need for immediate hospitalization. All patients presenting with syncope except vasovagal are at increased risk of death from any cause. The AHA/ACCF syncope guidelines present an algorithmic approach for the evaluation of syncope. The most important diagnostic tool remains the history and physical examination. All patients presenting with syncope require an electrocardiogram, orthostatic vital signs and interval monitoring. Patients diagnosed with neurally-mediated or orthostatic syncope usually require no additional testing. In cases of unexplained syncope, further testing such as electrocardiographic monitoring, echocardiogram, ischemic evaluation and electrophysiological studies may be required. Although a small subset of patients will remain undiagnosed, those undergoing comprehensive evaluation are unlikely to have a recurrent syncope event.